100% of each dollar donated goes to the Bryce Home country of your choice. Administration is paid for with other donations. We strive to keep overhead costs to a minimum. Bryce Homes International was founded by Understand The Times as a program to assist widows and orphans around the world. The program is in memory of Bryce Oakland (1974 - 2001). We have a building program to help some people with their basic living conditions. With your donations we were able to install good heating and cocking stoves so heating and cooking would not be a fire hazard. Roger visits Myanmar a few times a year. Roger takes that opportunity to personally witness to the people in that part of the world. The faith there is primarily Buddhist and they need the Lord Jesus. We have men that are there all the time to lead the program and UTT Myanmar. The Bryce Homes in Myanmar used to be called Bryce Lodge. 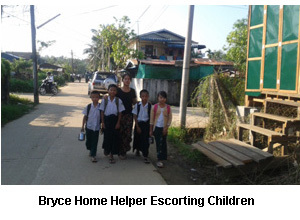 Roger first established the Bryce Lodge program in Myanmar and we accepted sponsorships for the individual child. We rented or bought a property. We had rents and leadership expenses that were not included in the sponsorship of an individual child. As the Bryce Lodge program grew and children graduated more children were added. We now take care of about 100 children. We now accept donations or sponsorships for homes rather than an individual child. These homes, as humble as they are, already exist so we don't need to rent or buy a property. We found this to be a better method and more orphans and Widows can be served. Along with caring for their own family they also take care of orphaned children. Along with caring for their temporal needs we, first and foremost, teach them about our Lord Jesus Christ. Some of the children have voiced a desire or are active to spread the Good News to their people! We thank all those who have sponsored children and helped with the other expenses. Your dollars are making an eternal difference in these children's lives, probably more than you know!. Greeting to you all the leaders and members of UTT in the matchless name of our Lord and Saviour Jesus Christ. 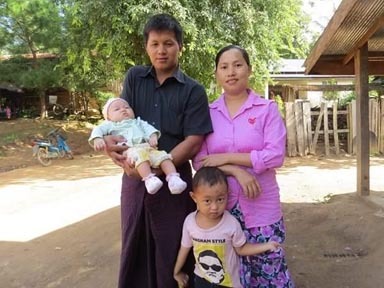 As my wife and I are called by God, we began to serve the Lord as missionary in 2010 at Tanhlin east of Yangon. In 2012, we got 5 new converted from Buddhist family. So, we began home church and now we all become around 40 members together. Since 2014, by faith we began child care ministry. My wife sell house use like soap, books and lady make up like face and hair apply house to house. By His grace, God gives our needs time to time. I am very much thankful when I heard the news that my family is starting to count as part of Bryce Home from 2017 and monthly financial support will be greatly blessed for our family and the works of missions especially for child care ministry. Now we all are 14 members together in our family. 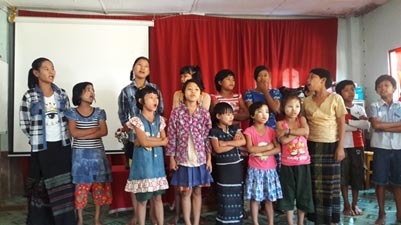 Our purpose is to train them to be good disciples of Christ and to be the good Christian leader who evangelize Myanmar with the Gospel of Christ. By the grace of God, I began outreach ministry since 2011. At the beginning, I got new one believer and have Bible teaching with that family. After that the Lord added new believer time to time and now around 30 members regular on every Sunday church service. We have children ministry on Saturday and on Sunday morning. We also have prayer meeting on Saturay with some women and home cell Bible study on Wednesday at 3:00pm. The most difficult time for me was last summer for my mother passed away with a car accident. But the Lord was with me in that time and turn my distress into spiritual blessings. My father is also encouraged as he is with me. By His grace, I newly married Dilisa on November 30, 2016. I am very thankful for the regular support I receive from UTT till the end of 2016 and grateful for your consideration from this new year and counting our family as apart of Myanmar Bryce homes. My life commitment is to be contented with what the Lord provides and to seek the Lord faithfully till the end of my life. Greeting to you in Jesus Name. Hope that you all are doing well. As for us, we all are doing well by the same Grace. We always pray for you and all Bryce Home around the world. We always thank the Lord and everyone who involves to support Bryce Home 4. We want to give you a report that we always receive financial support quarterly from Habakkuk. 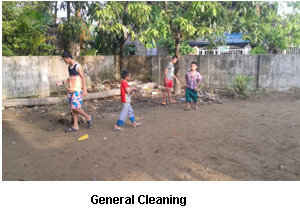 Through which the children have been trained to have Biblical foundation in life. They are from mix Animists and Buddhist background. Their parents are poor and they are unable to support their children to go to school. By His grace now, they are grown up very fast with education and with the Word of God. Please continue to uphold us in your prayer that all the children might become useful servants of God in the day to come. We have some plans to have self-sustained ministry in the near future. I want you to know that by prayer we support Roger and group from UTT and Elisha and Habakkuk so that God will continue to lead you. I am Shwe Shwe Oo. I want to say that God is so good to me. His love that I have found is a strength for me today through UTT. That is the reason why I am here as a Sunday school teacher under His great care. Actually, I do not feel I deserve to receive financial support each month. May God bless Roger and all who share their love to a very neglected person like me till today. First of all, I praise God for His great grace and leading hands that we might serve Him all these years in spite of bearing many weaknesses. We want to express our heart felt thanks to everyone who prays for us who help us financially faithfully per month and all our co workers who always encourages us with the words. Even in this new years 2017, we rededicated all our lives and times to God for His kingdom extension and to fulfill whatsoever works are set before us with joy. 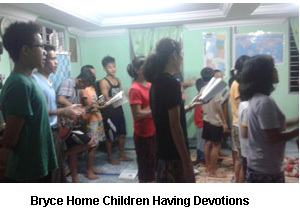 Precious is the previlege of serving our great king as apart of Myanmar Bryce Homes. I would like to express my hreat felt thank to a channel UTT whom God used to support our family. with the monthly support we receive that is used for my family living and our children education. What we always emphasize in our daily prayer is that all our children might be useful servants of God in the days to come. We have private primary school for the farmer’s children. It existed because village school is very far from the farm fields and families who are in farm fields could not effort their children to send to shool. To have self support: 1. we have rice field in Delta area. 2. We do sell and buy land. 3. We have Machine for reaping paddy rice. I greet you all in Jesus name. By His grace, we all the Bryce Home 9 family members are doing well. Because of your faithful support, I can continue to serve the Lord joyfully till today. We pray for you everyday that you all might continue the works under the protection and guidance of the Lord. We have some plants in order to have self supports. As we are working among Animists and Buddhist background, we try to be good example even in working by having self support. We see a lot of progress in our church activities. Please continue to uphold us in your prayer that our church might grow in grace and in the knowledge of our Lord and Saviour Jesus Christ. We acknowledge that it is God who uses you to account our family as Bryce Home 10. So, we praise God for His wonderful works in our family. 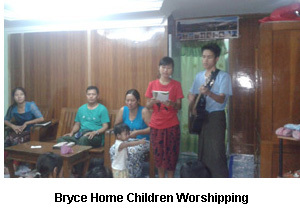 The encouragement with patients by Bryce Home leaders are used to open our spiritual eyes so that we can see the goodness of God and stand strong for the Gospel of Christ in the very dark area of Myanmar. We also want to give thanks to everyone who get involved in our financial support. We have bean plants to have self support. We will continue to pray for you all. 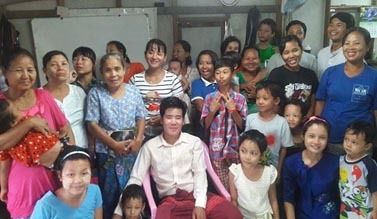 Sumpi is a like- minded missionary who is planting the church among Buddhist community in Tanhlin township located in the east of Yangon. 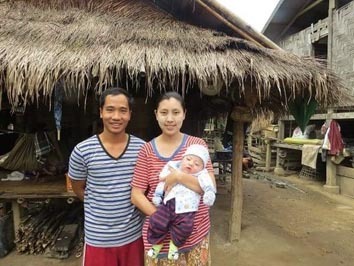 With his wife Mawite they have three children and care another five children. 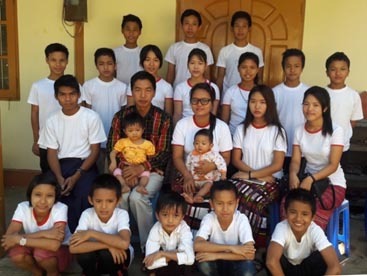 Including Thangpi his brother and his mother, they all are 12 together in their family. They run this ministry by faith. He always actively involves in discipleship training and in evangelism. He is one of Myanmar UTT board Members. 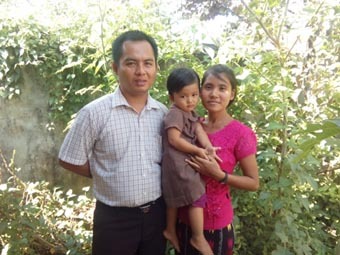 Khuasik is a UTT Missionary who has an outreach church at Yu Yu Lay. He always actively involves in Gospel preaching regardless of the situation. He has regular home cell on every Wednesday and church service on every Sunday afternoon. Numbers are increasing year by year. Now, there are 20-30 people regularly come to his house on Sunday. UTT Missionary support is really useful in this mission field. He also has many Saturday and Sunday School children. He is going to marry on November 30 with Nawdilisa. Including his father and with a very neglected child he cares, they all are going to be 4 members in their family. There is a great hope to extend His Kingdom there. Christopher, Nawmai, Hming Sangi and Sarah are Grade-10. Nathan is Grade-9. Lydia, Hruaia and Liana are grade 8. Ngura and Samuel are Grade 7. Val Thawm, Enna,Kyaw Soe Aung and Ma Chuani are Grade 6. Joshua is Grade 2. Blessing become 14 months and Joseph becomes 7 months. No matter where they will be in the future, as they have been trained, we trust that they would be good witnesses of our Lord. His faithful leading hand in the past become a great strength for today. Please continue to pray that all these children might grow up in God's way and will. 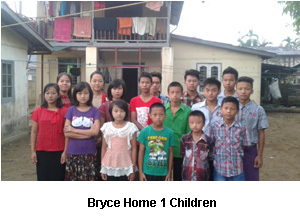 We take it as a great privilage to be a part of Bryce Homes Myanmar as it was my fisrt priority to do have a children care ministry from the begining. God has blessed the ministry that we now have more than 20 converts from animists background. We are always thankful to you for all your helps that enable us to fulfill our vision here for our people. I can say that the kids are the future stars to give light to the darkened hearts as they have been being taught and trained with the Word of God. The fund that you gave and sent for self support was used to buy and plant the Yam seeds and star-shape-bean trees and now is progressive. More succesful in Yam seeds plantation. It helps out a lot especially for covering the unseen and unexpected needs. We pray for you everyday. God bless you and all your family members for His glory. It is a great privilege for me to serve God who is my savior as a part of Bryce Homes under UTT since 2011 during which we have many developments in the lives of the children. This is a God ordained miniistry that He has prepared your lives for His glory. We are always thankful to you for your love and care for the needy children for which you have made a faithful commitment. And we pray for you every day that you would be able to keep up your commitment. In Bryce Home five we have thirteen students; two are studying Grade 9, one Grade 7, five Grade 6, two Grade 5, one Grade 3, one Grade 2 and one in KG class. For self supporting i have been trying to find a good work. One thing i have in mind that will benefit. That is planting gingers in my native place for which i would not need to stay there long times. One kg of ginger seed can produce seven fold (1kg into 7kg) in one year. I need to borrow the land (maybe 2 yrs) and buy the seeds and labor fees for cleaning weeds. Please continue to uphold us in your prayers. Shwe Shwe Oo keeps on doing Sunday School ministry in her own level best. I should say, from hopeless situation, becoming like this is a great and wonderful work of God. At the beginning her skin desease was so serious without beeing cared and without learning even how to read and write but after being cared at Bryce Home 3, now she can read the Bible very well and becomes Sunday school teacher. So, Bryce Home support is really a great blessing to encourage her to press on doing what she is doing now and even for their family. 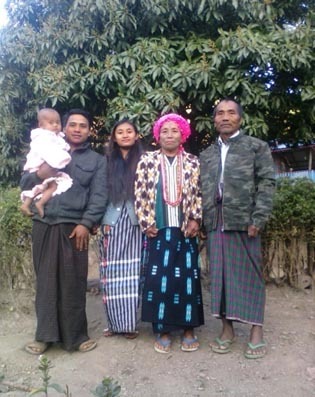 Salaphan's family is now serving the Lord at Shwelinpan as a pastoral care at the same time they are working hard for chlidren ministry. "We will do the Lord given work in full time and God will give us the need". This is Bryce Home 7 commitment and statement. This family is a special family who can set a good example for others. So, Bryce Home support is very helpful and meaningful for their outreach ministry and for their family living. Please pray that they might continue to be faithful to God and for the work that lay in their hand. Thar Neu is now serving near West Yangon University. They stand with the Gospel of Christ for Delta area villages. Through their family we have shared the Gospel in many villages and house to house. They are good in hospitality. They always have sick people in their house coming from villages. Some come for finding works in Yangon. Helping them at the same time sharing the Gospel in their nightly prayer meeting is a good privilege. I should say God raise this family out of many difficulties and bless them in so many ways. They have four children including adopted son whose name is called Goel for they become kinsman redeemer for his life. So, financial assistant at the same time serving the Lord with them is a great privilege. 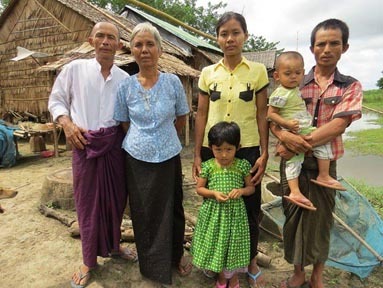 Please continue to pray that this family might be used greatly to extend His Kingdom among Buddhist community. Ling Khaw Ghei is an outreach church pastor among the animist at Lukpe village located in Southern Chin State. We can say they are neglected people because it is a remote area and no fine transpotation there. We recognize that this family is chosen by God to lead their people in God’s way. His wife got a job as a primary school teacher. He also plants some Yamseeds with the purpose of self sustain. His parent are with them. They work very hard in teaching the children with Christian Education. Year by year we see a lot of progress in the church especially from the life of the children. Please continue to uphold them in prayer. Man Ti Lung's family (Bryce Home 10) is located in Delta area. They are the only Christian family. But the Lord has begun the work there through this family. So, whenever we get there, we encourage them to stand strong and remind God's plan and purpose through their family in that region. There are some families who come to interest from the people whom we have shared God's word there. Our prayer is to build Biblical New Testament church there. There are 30 children in this Bryce Home. SKLian and his wife are the leaders. This home comes into exist through the vision God gave to this couple. They work very hard for the Lord. 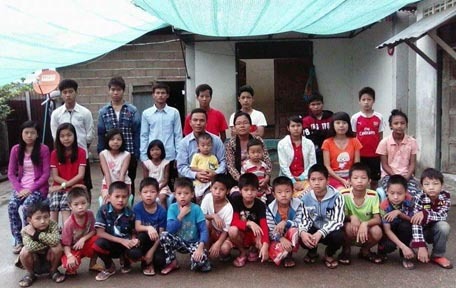 First they took few children from Lahu villages. And as their lives were changed rapidly, people come to recognize and some other parents bring and beg to care their children to them. Through those children, parents come to open their heart to the Gospel. This becomes a great testimony for them. She has unspeakable joy and uncountible testimonies to share with us. They are really in need of help financially at the same time encouraging their children with the Words of God. We have been blessed with three children. We have a small farm land and grow rice and we do a small live stock as we are now keeping some piglets. We are planning to make chicken farm if we can afford so that we can be self supportive even to help the needy ones around us especially of our fellow believers in our church. Phoebe is a leader of women fellowship and sunday school in the church. And she has always been trying and praying for preschool class for the children in Bethel. Please continue to pray for the work of the ministry we have for our people through evangelism and any means we can. Ali Ju Ju is gifted in Music and sound composer. He is a music leader at New Bethel Baptist church. At the same time, he is assistant pastor of Timothy. And he also has an outreach church in Tarley among Buddhist society. Please pray that he might be used greatly there for the extensions of His Kingdom. By the grace of God we are serving in Medkan village where almost all are Buddhists. Now God blesses us to see some new believers for them we have a regular worship service as a local church and we also have a teaching program for their children on every Sunday morning. We are praying for a convenient place to worship. My wife and i have a commitment to serve among this area in all ways we can. A letter from Daw Naca. I praise God for allowing me to take part in Bryce Homes family. As a widow there had been times for discouragements but God is so good to me and my son Obed's family. God has now opened the door for me to take part in Bryce Homes in Bethel and teach Sunday school children. We work growing rice and maize plants with which we keep pigs and sell the pigs for buying rice bags for the year. We pray for God's way for our future. My son has passed Grade 10 and he needs to find a job. And we pray for every day. God has placed us here near Chaingtung town where people are much addicted of drugs and young ones are totally currupt morally. I make a truely commitment for this people. Because though there has long been one baptist church almost all are influenced by a bad pastor who use drugs, and all are only so called christians, no Bible doctrine based, no Chirst centeredness and so no true believers in Christ. God has a special purpose for this and so I was voted to be a youth leader in the church. As God gives me favour from majority of members and now they love me and want me even to lead them as a pastor. But my vision is not to be a pastor unless I have a call to be in future. 1. To start a care for young students who could not afford for residence in this town during their schooling (as boarding) so that I can get a good chance to teach the Word. 2. To lead and start as a church for all people around us as we live at the boundary of Lao. Please continue to pray for my vision for God's glory. 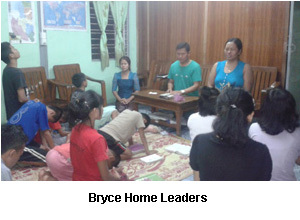 It is God's grace that allows me and my wife (Elizabeth) to serve Him as a part of Bryce Homes Myanmar. We have two children. We have an outreach church among Lahu people. We work plantation and live stock like keeping pigs with the purpose of a better livelihood. Thank you very much for your helps that makes us to do such works and pray we can do more even to help others also while sharing the Word of God. First and foremost I greet you all from Bryce Homes One and Two in the precious name of our Lord and Savior Jesus Christ. I have great pleasure in writing this “Year End Report” of Bryce Homes One and Two of 2014/15 Academic year. 1. The Resident Children: This year there are 15 children at each Home. And, there are two leaders and one helper at each home. I am pleased to inform you that all the children as well as the leaders and helpers are keeping well. We are really happy that the children are able to go to their perspective. schools regularly. They go to two different schools. Most of them go to No. 1 State High School, and some to No. 3 Middle School, Insein Township, Yangon. 4. Second Semester Examination: In December 2014 all the children will write their Second Semester Examinations. And most of the grades will write their Final Examinations in February 2015 while Grade 11 will write in March. 5. The Activities: As usual practice evening devotions are organized every Wednesday, Friday and Sunday evenings. Generally, the teachers take the lead in turn. It is inspiring to see that sometimes the older children also take the lead in turn. Usually, the leader reads the Bible portion, and the children follow. The leader gives encouragement from the word of God. After hearing the message intercessory prayer is said. In these evening devotions the teachers teach the children gospel songs, choruses and action songs. A short Bible portion is also memorized by the children. 6. Sunday Schooling: The children of each Bryce Home is divided into two classes: Primary and Junior respectively. Sunday School is organized in Sunday morning at 08:00 am. And, the students of Grace Theological College are sent to help teaching the children the word of God. 7. Sunday Worship Service: At Sunday morning worship service, the children present the song they learned at their Sunday Schools. They recite the Bible portion they memorized at their Sunday Schools. The congregations are inspired through the presentations of the children, and the testimonies given by the children. The Lord is greatly glorified and exalted when we worship together as a family. To conclude, all the children are very happy to be at the Bryce Homes One and Two. Many children are physically grown up. They are so thankful to the sponsors for their financial supports. May the Lord use these children for the extension of His kingdom in Myanmar. May the Lord bless each and every one of the sponsor who have committed their lives to support these poor children. We will bring some second hands clothes and 2000 Gospel tracts forndistribution. As God has opened the way to reach Buddhist villages, we take it as a privilege and will use all the offering and tithes that we have in our hand. Our time in Yangon has gone by very quickly. Each day Tom and I have spoken morning and early afternoon at the “Making Disciples Conference.” The conference was attended by all of our Bryce Lodge leaders, the Discipleship School of Ministry students and a number of men who came to Yangon to the conference from distant areas. We have visited all of the Bryce Lodges here in Yangon and spent time with Andrew, leader of Bryce Lodge Four who is located in a remote area of Myanmar. As this is the 7th year that Understand The Times has been involved in ministry in the country of Myanmar, we have seen many changes and abundant fruit. To see the children growing up into young adults has been a blessing. They will soon be ready to take the next step to go beyond grade eleven and make choices with regards to what they will do the rest of their lives. This March five students in Bryce Lodges One to Three will write their final high school exams. This will determine the next phase of their lives. We are presently praying about what our responsibility will be from this point on. Some would like to go to Bible School and become pastors and missionaries. One would like to go to medical school and become a medical doctor. When I return from Myanmar we will post updated photos of all the children individually on our web site under Missions Myanmar. We made all of the children aware that God has given them the care they have received because of the love and generosity of their sponsors that come from all over the world. 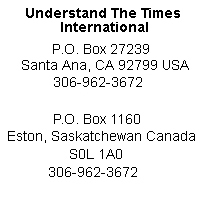 Understand The Times is only the channel through which God is working to enable the Bryce Lodge Program. The School of Discipleship is approaching the end of its first year. Seven men have been taught and encouraged to reach out to the surrounding area to share the gospel message. Two of them plan to immediately serve the Lord by planting a church. We are also considering supporting 8 new missionaries from various parts of Myanmar who attended the conference. The challenge ahead for us in Myanmar is very great. It appears there is strong possibility that inflation will change the way we can do ministry here. We are grateful to those who have caught our vision and we will continue to do all we can do and be good stewards of the resources that have been put in our hands. I thank God for Tom Worthington who has been a great encouragement to me in coming along side to help with administrative skills and his help giving spiritual guidance. Please keep Mission Myanmar in your prayers. When I return I will try to put together some video presentations that will show you what God is doing here in this very dark country. The following are how we spent time in these 10 days trip. We started sharing the Gospel from the Ship. After that Village to Village and house to house, we sang Gospel songs, shared the Gospel and prayed for the families. We also have privileges of church worship services in 3 villages and distributed more than 3000 tracts,. By His grace, we shared the Gospel to different kinds of people. Some are head of the villages, some are strong Buddhists and some are young people who led us to have house to house visitation. Wherever we go, the Lord prepared people to receive us to their house. The way God has led us and how He works to the unbelievers are beyond our thoughts. We experienced that the Lord have drawn people's attention to the Gospel of Christ. What we need is to keep in touch these people with the pure Word of God. So, we cry out to God and you to work with us in prayer and also in the way you can. God needs His people in Myanmar. Thanking God for all that He has done through your support. Good to know your mission trip to Africa. As for us, by His grace, as we have committed to obey to the Great commission of our Lord, we continue reaching people with the Gospel by taking it as our privilege. It is my pleasure to report you how we have movement in Yangon. Saturday morning is set aside for prayer, afternoon both some of Bl3 children and Making Disciple students and teachers have hospital evangelism. Last Saturday, we covered up 32 beds. We shared the love of Christ to the sick people and keepers. We praise God for such a privilege. Sunday morning, we have Sunday school at 4 places. Noon time we have church worship service and afternoon, we have home cell service at least 3 places on every Sunday. Mostly, we go according to the house owner’s invitation. Monday to Friday, we have regular Making Disciple classes. 6:00-7:00am is for quite time. 7:00-8:00am is for Breakfast. 8:00-9:00 is for devotion service. 9:00-11:00 is for morning class. 11:00- 12:00am is for Lunch. 12:00-2:00pm is for afternoon class. 2:00-5:00 is for personal evangelism two by two. By His grace, we have regular classes and house to house evangelism and tract distribution. 5:00-6:30pm is for dinner. 6:30 -8:30 is for study hour and after that under the leadership of missionary Khuasik, they have home cell service. They don’t stop even a single night since 5 months back. At the same time at Bryce Lodge 3, our children are all doing well. They have regular schooling day time. At night before they study their lessons, we have night prayer meeting. They have memorized many Bible verses. We read one chapter every night. Shwe Shwe has memorized and can recite Ps.119:1-80. Saturday night is set aside for the children’s preaching the word of God. Good to tell you that some of them become good preachers. They tell the Gospel even to their Buddhist class mate. They also can proof very well of Creation to their friends. n this coming December we are planning to have a mission trip to Dalta areas. And we also plan together Buddhists people and have Salvation Camp. We try to fill up as much as we can in sharing the Gospel. Please pray that lost souls might be saved and that we might be strong only in Him.